When you notice the telltale signs of water damage on the ceiling or walls of your home, it can be very stressful. You start panicking, worrying about where it is coming from and how hard it is going to be to fix it. Probably the most common reasons gutters leak and the one easiest to fix is clogged gutters. When you keep avoiding the dreaded chore of cleaning out your rain gutters, they will just fill up with debris making them unable to do their job, routing the runoff after rainstorms from your roof so it drains away from the house so there is no water damage. When the gutters can’t do their job, the water will damage the roof and come down the walls of your home and mold can become a real health hazard. When gutters are clogged they also will start to sag and may pull away from the fascia causing even more damage. The best way to prevent this from happening is to regularly clean out the gutters yourself once or twice a year and after big storms for extra precaution. If you are not comfortable doing it yourself, then you can always hire a gutter cleaning company to do it for you. Gutter systems endure a lot of wear and tear over the years so it is inevitable that leaks and holes will happen. If you are handy, a lot of this you can fix yourself. A leaky gutter joint can easily be sealed up with some caulk and small holes may only need some gutter sealant. For larger holes though you will need a gutter patching kit. Sometimes there can be problems right from the start when a gutter system is not built properly. If you try to install the gutters yourself and you don’t have a lot of experience or you hire a company that uses a lot of unskilled workers, you make be at risk for poor craftsmanship. One common mistake made by the uninitiated is installing improperly pitched gutters. Gutters should be pitched down toward the downspouts with at least a quarter inch of slope for every 10 feet otherwise you will end up with standing water. Another installation mistake is when the downspouts are put too close the foundation of the house. When this happens the water will end up in your basement. 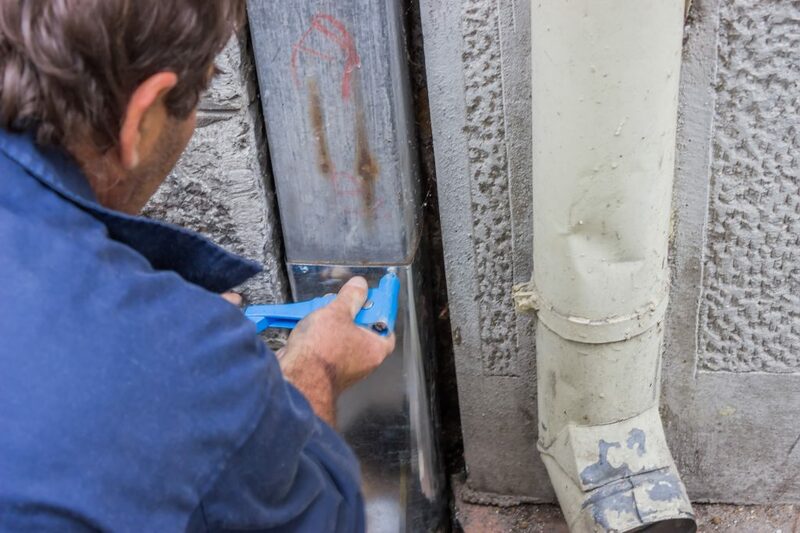 If you don’t want to rip out the downspouts and redo everything, you can attached gutter extensions to the bottom of the downspout to redirect the water from the foundation of your home. If your home doesn’t already have a rain gutter system, it is important to get one. Whether you install themselves or hire someone to do it for you, there are a lot of different options that come in different range of costs as well. Vinyl gutters have become one of the most popular choices for gutter systems. Their benefits include the ease of installation and the fact that you never have to worry about them rusting. They are also a more economical choice. Because the pieces are lightweight and easily snap together installation is also a lot easier making it easier for those homeowners who want to do the installation themselves. The only caveat is that if you live in colder climates, there is the chance that the vinyl can crack over time, and if you don’t install these properly, you may have water pooling in certain sections. Another popular type of gutter is one made of aluminum. These like the vinyl ones are lightweight and rust-proof and if you are a DIYer, it won’t give you any particular headaches during the installation process. Other pluses with this type of gutters is that it, unlike vinyl, can withstand cold climates and can be painted whatever color will look best with the outside of your house. They also come in seamless models. One of the concerns, with choosing aluminum gutters, however, is that it can be easily dented or bent from a whack from the ladder or being stepped on by accident. If you are going to go with aluminum gutters make sure they are made of primary aluminum which is of a higher quality and sturdier than if you choose a system made of recycled aluminum. Vinyl and aluminum gutters are considered two of the best types of gutters because they are cost efficient, meaning that for what they cost, they do their job well. And they are not over the type expensive either. Stainless steel gutters are another great option, but they come with a heftier price tag. These gutters are the sturdiest of the bunch and they won’t rust at all so if you have the extra money to spend it is a good investment. Copper and wood gutters are two other options out there, but typically they are only popular with architectural purists who have the money to preserve a certain look to their wood. For example, if you own a historic home, to stay true to the original home you will want to choose wood gutters. These will be a big financial investment though. Besides the material of the gutters, you need to decide between sectional versus seamless and K-Shape or Half-Round shape. If you prefer the seamless model, you are going to have to go with an aluminum gutter system because that is the only type that currently offers a seamless option. In addition, when choosing the shape of the gutters, keep in mind that K-shape gutters carry more water and are more structurally sound than the half-round shape. What Are Gutters Made Of?